Trafic is both the best and worst way Jacques Tati could’ve concluded the adventures of Monsieur Hulot. Considering the path Tati set ahead for his beloved character, it’s only logical that where this film goes be the next (or, as it turned out, last) stop on his journey. But for anyone who’s seen one of the previous Hulot pictures, you’ll know that logic is the man’s worst enemy. Unfortunately, in the case of Trafic, it’s a formidable foe that does a good job of vanquishing most of the charm, fun, and wry social commentary the series had held dear beforehand. Picking up after the eventful day he experienced in Playtime, Trafic begins with Monsieur Hulot (once again played by Tati), once depicted as a seemingly eternal wanderer, now gainfully employed. He has his hands full serving as a designer for Altra, a French automaker preparing for a big car show in Amsterdam. They plan to show off their latest creation, one actually borne of Hulot’s mind: a recreational vehicle decked out with all sorts of gadgets, leaving campers with all sorts of modern conveniences at their fingertips. But Hulot and the crew accompanying the car have hardly set foot out the door when trouble strikes their little trek. Vehicle malfunctions run rampant, and the group’s attempts to fix things usually end up with them wandering off on some unforeseen detour. It soons becomes doubtful that Hulot and company will even make it to Amsterdam, if they don’t pull off of their road to nowhere in time. I really hate that I’m as disappointed with Trafic as I am. I sort of feel like one of the fans in Woody Allen’s Stardust Memories, griping about how much I prefer Tati’s earlier, funnier films. While this is part of how I feel about Trafic, it’s not the end of the story. Sure, when you get down to basics, the film quite simply isn’t as funny as Mon Oncle or M. Hulot’s Holiday. It’s lacking in the sort of physical comedy that Tati specialized in and perfected, the sort of gags that required great precision to pull off and left you amazed as well as amused. Instead, Tati seems to dance around the humor, conveying it in a way that’s either too downplayed or virtually nonexistent. The characters just wander around for most of the movie, and when a set piece does arrive, it doesn’t feel right, as if Tati tried too hard to get to that point instead of letting it flow with the story. There’s also the possibility that Trafic could be Tati’s own private joke; he wanted to move away from Hulot with Playtime, but when that film bombed, he had to conjure up this flick to pay the bills. If it was Tati’s intent to voice his displeasure at having to rehash Hulot over and over again, he succeeded — but he forgot to include the audience in on the joke. But what I missed most while watching Trafic was Tati’s satirical flair. The first three Hulot pictures presented jovial jabs at modern society that increased in punch and severity with each film. Such themes reached a fever pitch with Playtime, but there’s next to no such attitude existent within Trafic. If anything, Tati feels like he’s been defeated, so instead of Hulot’s eccentric ways fighting against the tide of a conformist society, the character has long since succumbed to it as the film begins. There’s just no message to back the story up, so the flick is left alone to flounder around in a sea of its own missed opportunities. Hulot is even given more dialogue than in the last three films combined (albeit hushed and in the background), in addition to actively participating in gags instead of serving as a mere catalyst. Tati’s aim isn’t entirely off, for there are a few subtle touches that earn a chuckle or two. A correlation between barking dogs and drivers screaming at one another after a fender bender was a nice touch, as was a scene in which windshield wipers mimic the personalities of certain folks at the wheel. But while such moments inspire a smirk here and there, they’re far from the satirical home runs Tati nailed in the last three films. 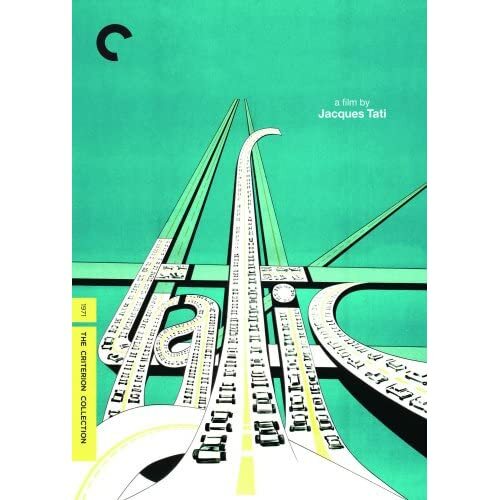 Trafic is worth seeing, though pretty much only as a Tati or Criterion Collection completist. As a film on its own, it’s occasionally diverting but hardly consistent; when compared to its brothers, it’s even worse off. Trafic has its moments, but it’s a much more sad send-off than Monsieur Hulot deserved. This entry was posted on Wednesday, October 1st, 2008 at 7:57 pm	and is filed under Reviews. You can follow any responses to this entry through the RSS 2.0 feed. You can leave a response, or trackback from your own site.